Beacon lighing at Scoulag Moor. The lighting of a beacon at the top of Scoulag Moor on Thursday evening brought to a close a day of events to mark the Queen’s 90th birthday. Organised by Deputy Lieutenant of Argyll and Bute, Stewart Shaw, with assistance from Bute Estate and the Rotary Club of Rothesay, the beacon - which had been built earlier in the day - was set alight by the Deputy Lieutenant’s wife, Fiona Shaw. Prior to the lighting of the beacon, Mr Shaw read a statement from the Duke of Rothesay which said: “Iam delighted that so many people throughout the United Kingdom are coming together to light beacons in celebration of my mother, the Queen’s, nintieth birthday. It is a wonderful gesture which I know has deeply touched Her Majesty. “Beacons are to be lit on mountaintops, on beaches, in farmyards and on church towers, uniting us all in our heartfelt appreciation of the Queen’s lietime of service to the United Kingdom and other Realms, and to the Commonwealth. 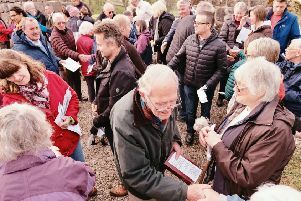 With refreshments for the toast provided by Bute Brew Co. and the local branch of the Co-operative, those present raised their glasses and participated in a rendition of ‘Happy Birthday’. * To purchase any of the photos featured above visit our photo sales site by clicking here.